For other uses, see Evangeline (disambiguation). Evangeline, A Tale of Acadie, is an epic poem by the American poet Henry Wadsworth Longfellow, written in English and published in 1847. The poem follows an Acadian girl named Evangeline and her search for her lost love Gabriel, set during the time of the Expulsion of the Acadians. The idea for the poem came from Longfellow's friend, Nathaniel Hawthorne. Longfellow used dactylic hexameter, imitating Greek and Latin classics, though the choice was criticized. It became Longfellow's most famous work in his lifetime and remains one of his most popular and enduring works. The poem had a powerful effect in defining both Acadian history and identity in the nineteenth and twentieth centuries. More recent scholarship has revealed the historical errors in the poem and the complexity of the Expulsion and those involved, which the poem ignores. Evangeline describes the betrothal of a fictional Acadian girl named Evangeline Bellefontaine to her beloved, Gabriel Lajeunesse, and their separation as the British deport the Acadians from Acadie in the Great Upheaval. The poem then follows Evangeline across the landscapes of America as she spends years in a search for him, at some times being near to Gabriel without realizing he was near. Finally she settles in Philadelphia and, as an old woman, works as a Sister of Mercy among the poor. 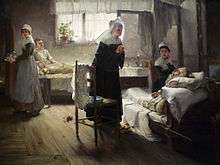 While tending the dying during an epidemic she finds Gabriel among the sick, and he sadly dies in her arms. Longfellow was introduced to the true story of the Acadians in Nova Scotia by his friend Nathaniel Hawthorne, who was told a story of separated Acadian lovers by Boston minister Rev. Horace Conolly, who heard it from his parishioners. Hawthorne and Longfellow had attended Bowdoin College together, though they were not friends at the time. Years later, in 1837, Hawthorne contacted Longfellow for his opinion on his recently published tales in the North American Review, which Longfellow praised as works of genius; the two became lifelong friends. Hawthorne was not interested in fictionalizing it so Longfellow turned it into a poem after months of studying the histories of Nova Scotian families. Longfellow, who had never visited the setting of the true story, relied heavily on Thomas Chandler Haliburton's An Historical and Statistical Account of Nova Scotia and other books for further background information. He noted his reliance on other sources in his journal on January 7, 1847: "Went to the library and got Watson's Annals of Philadelphia, and the Historical Collections of Pennsylvania. Also, Darby's Geographical Description of Louisiana. These books must help me through the last part of Evangeline, so far as facts and local coloring go. But for the form and the poetry,—they must come from my own brain." Evangeline was published in book form on November 1, 1847, and by 1857 it had sold nearly 36,000 copies. During this time, Longfellow's literary payment was at its peak; for Evangeline, he received "a net of twenty-five and sixteenths per cent" royalties, believed to be an all-time high for a poet. Longfellow said of his poem: "I had the fever a long time burning in my own brain before I let my hero take it. 'Evangeline' is so easy for you to read, because it was so hard for me to write." Samuel Richards's painting "Evangeline Discovering Her Affianced in the Hospital"
The poem is written in unrhymed dactylic hexameter, possibly inspired by Greek and Latin classics, including Homer, whose work Longfellow was reading at the time he was writing "Evangeline." He also had recently, in 1841, translated "The Children of the Lord's Supper," a poem by Swedish writer Esaias Tegnér, which also used this meter. Evangeline is one of the few nineteenth-century compositions in that meter which is still read today. It certainly would be a relief to the hexameters to let them stretch their legs a little more at their ease; still for the sake of uniformity I believe they must still sit a while longer with their knees bent under them like travelers in a stage-coach. The name Evangeline comes from the Latin word "evangelium" meaning "gospel." The Latin word itself is derived from the Greek words "eu"—"good"—and "angela"—"news". Evangeline became Longfellow's most famous work in his lifetime and was widely read. Contemporary reviews were very positive. A reviewer for The Metropolitan Magazine said, "No one with any pretensions to poetic feeling can read its delicious portraiture of rustic scenery and of a mode of life long since defunct, without the most intense delight". Longfellow's friend Charles Sumner said he had met a woman who "has read 'Evangeline' some twenty times and thinks it the most perfect poem in the language". Other admirers of the poem included King Leopold I of Belgium. It has been called the first important long poem in American literature. 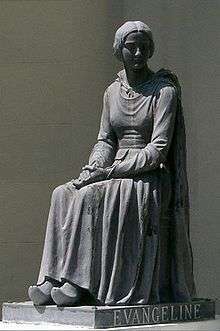 Louis-Philippe Hébert's sculpture of Evangeline, Grand-Pré National Historic Site, Nova Scotia, Canada. Prior to the influence of Longfellow's poem, historians generally focused on the British founding of Halifax (1749) as the beginning of Nova Scotia. Longfellow's poem shed light on the 150 years of Acadian settlement that preceded the establishment of Halifax. The Expulsion was planned and executed by New Englanders and British. Longfellow omitted from the poem New England's responsibility for the event. Through his poem, Longfellow defines the British as responsible for the expulsion and America is cast as a place of refuge. Longfellow's account was later challenged by Francis Parkman, in his book Montcalm and Wolfe (1884). Rather than blaming the British, Parkman defined the real problem in expulsion as the French influence on Acadians, particularly by Abbé Jean-Louis Le Loutre. American historian John Brebner eventually wrote New England's Outpost (1927), which identified how instrumental New Englanders were in the expulsion of the Acadians. The poem had a powerful impact in defining both Acadian history and identity in the nineteenth and twentieth centuries. More recent scholarship has revealed both the historical errors in the poem and the complexity of the Expulsion and those involved, which the poem obscures. For example, Longfellow's poem renders Acadie a utopia and the Acadians as simply a homogeneous, passive, peaceful, innocent people but obscures the resistance that certain Acadians demonstrated, both politically and militarily, against the British invasion of Acadie. The poem also led generations of Protestant anglophones to sympathize with the plight of a people they often demonized and persecuted for being Catholic. The poem also provided a safe symbolic space for Acadians to develop arguments for more recognition and respect. In 1920, at Grand-Pré, Nova Scotia, Acadians reconstructed the French church with a statue of Evangeline in the courtyard. Almost a decade later, in 1929, a statue of Evangeline, posed for by silent Mexican film star Dolores del Río, who starred in the 1929 film Evangeline, was donated to the town of St. Martinville, Louisiana by the film's cast and crew. In 1934, the first state park in Louisiana was named the Longfellow-Evangeline State Historic Site. Felix Voorhies wrote the book Acadian Reminiscences : The True Story of Evangeline and other later works of fiction expanded upon the material of the poem, claiming the "real names" of the characters had been "Emmeline LaBiche" (in Longfellow, her full name is Evangeline Bellefontaine) and "Louis Arceneaux" (in the poem, Gabriel Lajeunesse) Lafayette, Louisiana, which supposedly belonged to Gabriel, and the grave of Emmeline in the Perpetual Adoration Garden & Historic Cemetery in St. Martin de Tours Church Square, on Main Street, St. Martinville (the site having been determined for its convenience by local boosters about the turn of the 20th century). "Evangeline Oak" trees in St. Martinville also lay claim to marking the original meeting place of Emmeline and Gabriel. Another site claiming to have relation to the historical figures that Evangeline was based upon is the Arceneaux House in Hamshire, Texas, which is marked by a Texas Historical Marker. The house was given to Mary Gadrac Arceneaux, great-great-granddaughter of Louis Arceneaux by her husband. Evangeline has also been the namesake of many places in Louisiana and the Canadian Maritime Provinces. Evangeline is the name of a community in Acadia Parish at which the first oil well in Louisiana  was drilled, a Parish in Louisiana, a rural community in Prince Edward Island, a residence hall at Louisiana State University, and a small settlement in the Acadian Peninsula in New Brunswick. It is also often used as a street name in Acadian communities. The Evangeline Trail is a historic route in Nova Scotia that traces the Annapolis Valley, ancestral home of the Acadians. Picturesque especially in Summer and Fall, the trail runs from Grand-Pré, site of the first expulsions, south to Annapolis Royal, Nova Scotia near the original French settlement in North America, Port Royal, Nova Scotia. More than a dozen small Acadian villages line the trail. There have also been numerous film adaptations of the poem Evangeline. Evangeline was the first Canadian feature film, produced in 1913 by Canadian Bioscope of Halifax. It was shot in the Annapolis Valley and at Grand-Pré. In 1919 Raoul Walsh made a film based on the poem for 20th Century Fox. It was suggested by and starred his wife Miriam Cooper. The film was one of the duo's biggest hits but is now lost. In 1929, Edwin Carewe made a film version starring Dolores del Río, shot in Louisiana and accompanied by a theme song written by Al Jolson and Billy Rose. The poem was mentioned in the movie Angel Heart, starring Mickey Rourke and Robert De Niro. Evangeline is also referenced in the 2009 Disney film The Princess and the Frog, wherein a Cajun firefly named Raymond falls in love with Evangeline, who appears as a star. Following his death, they are reunited, and both appear side by side in the night sky. A popular song in French titled "Evangeline" was written in 1971 by Michel Conte. Originally sung by Isabelle Pierre, a version performed by Annie Blanchard won the ADISQ award for most popular song in 2006. Robbie Robertson of The Band wrote the song "Evangeline," performed with Emmylou Harris. In his lyrics, Evangeline is a girl from the Maritimes who awaits her absent lover in Louisiana, but the storyline and time period differ from Longfellow's original. A half-hour suite of guitar music by guitarist and composer Loren Mazzacane Connors, based on scenes in the Longfellow story, was released as a compact disc titled Evangeline (RoadCone, 1998), with a title track vocal by Suzanne Langille. Indie folk artist Tony Halchak released an EP titled A Tale of Acadie in 2011, based on the poem but told from Gabriel's point of view. The poem was first adapted into a theatrical musical in 1874, as Evangeline; or, The Belle of Acadia, which was a Broadway success through the late 19th century. A 1999 adaptation by Paul Taranto and Jamie Wax, Evangeline: The Musical, resulted in a 1999 cast album, and a Shreveport, Louisiana production of this version was broadcast in 2000 by PBS. A 2013 musical adaptation, by Canadian Ted Dykstra, premiered in Charlottetown, Prince Edward Island, and was revived in 2015 in Prince Edward Island and in Alberta at Edmonton's Citadel Theatre. The production featured Brent Carver as the father. An opera based on Evangeline, composed by Colin Doroschuk, debuted in 2012 in reduced concert form, and was first performed in full in 2014 at Opéra-Théâtre de Rimouski. Doroschuk had previously been a member, with his brothers, of the Canadian pop band Men Without Hats. The opening phrase of the poem, "This is the forest primeval," has entered the cultural lexicon. A depiction of Evangeline from Longfellow's poem was incorporated into the Dominion Atlantic Railway logo along with the text 'Land of Evangeline Route'. Additionally, there was once a Via Rail train known as the "Evangeline" that ran from Halifax to Yarmouth, but it ended in 1990. L'Évangeline was also an important daily newspaper in New Brunswick, from 1949 to 1982. Evangeline Downs is a horse racing track located near Lafayette, Louisiana. Evangeline was the nominal inspiration for the so-called lightning bug (which is, in fact, really a star in the night sky) of whom Ray is enamored in Disney's The Princess and the Frog. Evangeline was recently performed as musical play at the Conseil acadien de Par-en-Bas theatre in Tusket, Nova Scotia. An actor travelled all the way from Louisiana to fill the role of Gabriel so the play could be made. Historical flaws in the poem (and in the Voorhies work) are revealed, as there is no record of the surnames "LaBiche", "Bellefontaine", nor "Lajeunesse" in any of the censuses taken of the Acadians. ↑ McKay, Ian and Robin Bates. In the Province of History: The Making of the Public Past in Twentieth-Century Nova Scotia. McGill-Queen's University Press. 2010; Barbara Le Blanc. Postcards from Acadie: Grand-Pre, Evangeline & the Acadian Identity. Gaspereau Press. 2003. ↑ Miller, Edwin Haviland. "Salem Is My Dwelling Place: A Life of Nathaniel Hawthorne." Iowa City: University of Iowa Press, 1991: 72. ISBN 0-87745-332-2. ↑ McFarland, Philip. Hawthorne in Concord. New York: Grove Press: 58–59. ISBN 0-8021-1776-7. 1 2 Williams, Cecil B. Henry Wadsworth Longfellow. New York: Twayne Publishers, Inc., 1964: 150. ↑ Calhoun, Charles C. Longfellow: A Rediscovered Life. Boston: Beacon Press, 2004: 189. ISBN 0-8070-7026-2. 1 2 3 4 Williams, Cecil B. Henry Wadsworth Longfellow. New York: Twayne Publishers, Inc., 1964: 155. ↑ Wagenknecht, Edward. Henry Wadsworth Longfellow: Portrait of an American Humanist. New York: Oxford University Press, 1966: 231. 1 2 3 4 Williams, Cecil B. "Henry Wadsworth Longfellow." New York: Twayne Publishers, Inc., 1964: 151. ↑ Wagenknecht, Edward. Henry Wadsworth Longfellow: Portrait of an American Humanist." New York: Oxford University Press, 1966: 129. ↑ Wagenknecht, Edward. "Henry Wadsworth Longfellow: Portrait of an American Humanist." New York: Oxford University Press, 1966: 77. ↑ Katsev, Igor. "Origin and Meaning of Evangeline". MFnames.com. Retrieved 2009-01-23. 1 2 Williams, Cecil B. Henry Wadsworth Longfellow. New York: Twayne Publishers, Inc., 1964: 82. ↑ Wagenknecht, Edward. Henry Wadsworth Longfellow: Portrait of an American Humanist. New York: Oxford University Press, 1966: 148. ↑ Wagenknecht, Edward. Henry Wadsworth Longfellow: Portrait of an American Humanist. New York: Oxford University Press, 1966: 8. ↑ John Brebner. Acadia before the conquest of Canada. Columbia University Press. 1927. ↑ McKay, Ian and Robin Bates. In the Province of History: The Making of the Public Past in Twentieth-Century Nova Scotia. McGill-Queen's University Press, 2010. ↑ McKay, Ian and Robin Bates. In the Province of History: The Making of the Public Past in Twentieth-Century Nova Scotia. McGill-Queen's University Press, 2010: 128. ↑ Williams, Cecil B. Henry Wadsworth Longfellow. New York: Twayne Publishers, Inc., 1964: 155–156. ↑ Louisiana Department of Culture, Recreation and Tourism. "Evangeline Oak Louisiana Historical Marker". ↑ Texas State Historical Commission. "Arceneaux House Texas Historical Marker". ↑ "HIST: First Oil Well - Department of Natural Resources - State of Louisiana". ↑ "Ariane Moffatt, Pierre Lapointe win deuces at ADISQ awards". CBC. 2006-10-30. Retrieved 2007-01-10. ↑ McKenna, Mike. "TONY HALCHAK – A TALE OF ARCADIE". ↑ "Musical of the Month: Evangeline". The New York Public Library. Retrieved 2016-04-03. 1 2 "Opéra-Théâtre de Rimouski in June Premiered Colin Doroschuk's Evangeline". Opera Canada. June 22, 2014. Retrieved May 12, 2016 – via HighBeam Research. (subscription required (help)). ↑ The Vanguard, Louisiana actor travels to Tusket,NS. ↑ Census Records, Incorrect Surnames. Wikimedia Commons has media related to Evangeline.